If Dr. Seuss had been a horticulturist instead of an author, I’m pretty sure he’d come up with a few of the fruits and vegetables that we have here in the Middle Kingdom. Let’s take a look at these strange denizens of the produce section. 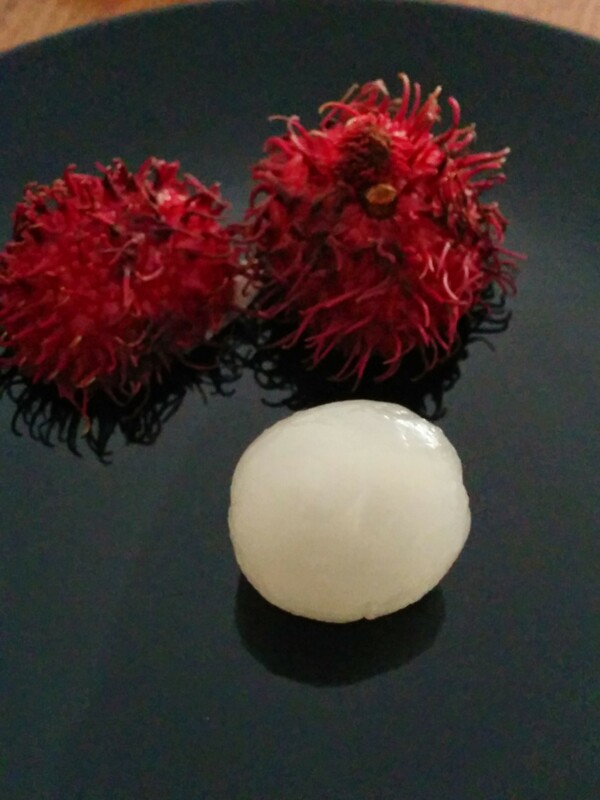 Today’s weird and wonderful fruit is rambutan 红毛丹 (hong2mao2dan1). Doesn’t this thing look like it could do you some serious harm? Despite their fierce appearance, the little curved spikes are actually soft and flexible, so you needn’t worry about impalement. Cut around its equator to open it, or you can squeeze it with your hand to crack it open. Inside is a round, translucent white fruit, very similar in taste, texture and appearance to longyan 龙眼 and lychee 荔枝, though milder. It pops out of the shell very easily. Good rambutan should be sweet and juicy. There’s a pit inside, about the same size as an almond. Fresh ones will have perky looking spikes and be mostly red in color. If there’s patches of black or squishy areas, or if the spikes look soggy and droopy, the fruit is probably past its prime. 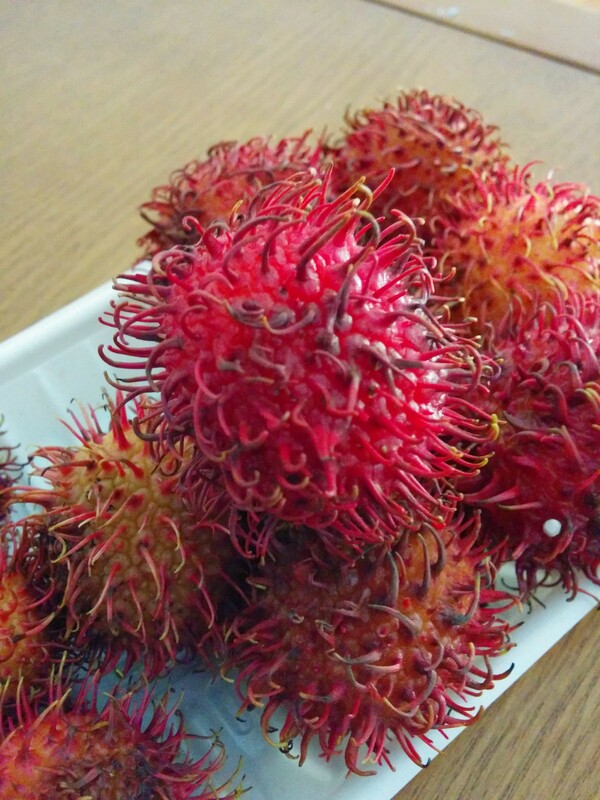 Rambutan are one of my favorite fruits, so I’m also happy to find these little guys in the supermarket. And I wouldn’t be surprised to see them decorating the pages of the Cat in the Hat. We love rambutan! They sell it as lychee in Honduras, and the season just started. Yum! How interesting that it’s called lychee there. Here, lychee, longyan, and rambutan are three different (though very similar) fruit. Yum, yum, yum! Enjoy some for me, Debbie!